Forced to navigate school and life with his newfound powers and fame proves to be difficult. But Ted's biggest challenge lies ahead, because he's not the only one with incredible abilities. Until he can sort out friend from foe, Ted may be the only person who can keep the world safe from total annihilation. The Dark Souls is the first novel in the action-packed Viral Superhero Series. If you like fast-paced thrillers, witty heroes, and evil villains, then you'll love Bryan Cohen & Casey Lane's high-octane series! 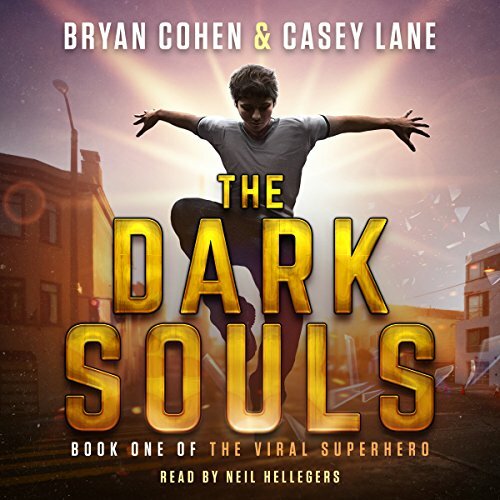 Dark Souls is a riveting audiobook focused on Ted, your average nerdy high schooler and his journey into superherodom! So not only does he have the typical boy loves girl, girl ignores boy problem but he has classes to pass! His first love identifies him as the Living Soul. His enemies are slowly revealed to him and some are people he’s known forever. He’s the only one that can save his small town and the world from the evil, sword-wielding dark souls. Fast-paced, engaging and fun thriller with clever dialog and action-packed moments. A must have – one will not be disappointed! This is not your typical superhero vs supervillain! Guaranteed to entertain. The storyline was well-developed, character development was spot on! Neil Hellegers performs the audiobook flawlessly providing action through his talented voice as well as keeping people on the edge of their seats. His character voices were perfect! Switching back and forth from British to American dialect was smooth. I enjoyed this book; the story flowed smoothly and accurately. This is a book that all ages would enjoy - especially those into science fiction. My only complaint – it ended. I enjoyed this first instalment of the Viral Superhero Series and I can't wait for more. The story is different and interesting, and it was easy to root for Ted, a generous, caring, normal teen who suddenly has incredible powers. The other characters are all interesting too. This is a great story, with teenage angst and romance, mystery and danger, and also quite a bit of humor. I highly recommend the story, but discretion is advised for those under 13 due to violent scenes. The narration was great. The delivery was smooth and even, and appropriate to the situations being narrated. Mr. Hellegers did a wonderful job providing different voices for the different characters so that I always knew who was speaking. I was fortunate to receive a complimentary copy of this audiobook from the author. This is my honest, voluntary review. I enjoyed the narration of this book as well as the story line of a new group of heroes. I believe this series will be engaging in either audio or book format. The suspense and comedy of the book really comes alive with the narration by Hellegers. There are some cliff hangers so I am eagerly waiting for my next credit to get the second book. Such a fun and great action-packed read that was different, exciting and interesting! A refreshing read that keeps you on your toes. Excellent characters. Loved the humour. I just love everything about this novel. Perfect for readers of fast-paced thrillers, witty heroes, and evil villains. This was an interesting story line. It failed to keep my attention. Certain times would be able to get it back but not for long. I mean Ted is a good character and I like Erica but not really until the end. Neil Hellegers did an amazing job with all the different characters and really captured the essence of each one. However not a big fan of the story. Great job Neil. Then they add something about dimensional wars and no one is really interested.... and that includes me.